Specifically built for holiday rental, Villa Solina is a spacious, single level house. This modern family home has 4 bedrooms, 3 bathrooms and 4 toilets. The house sits on a large landscaped block in the quiet cul de sac of Solina Close. 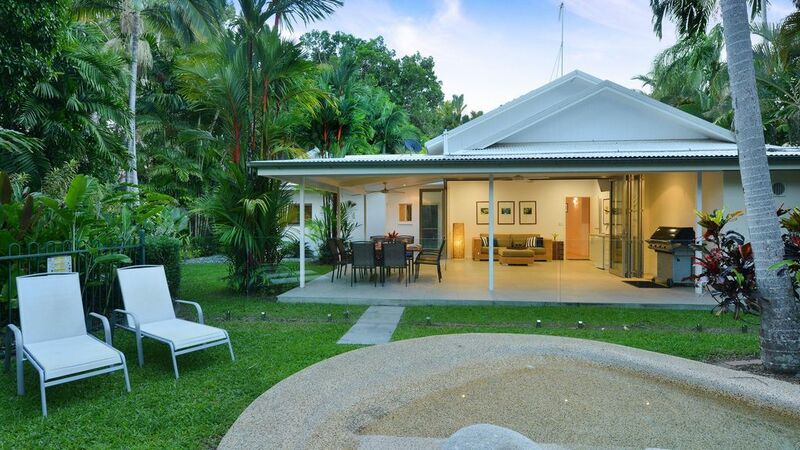 Located less than 100 metres from Four Mile Beach, the large grounds and heated pool, air-conditioned bedrooms, WiFi Internet and extra TV room guarantee a comfortable and relaxing holiday. Entry is via the open plan living room, dining room and kitchen. 7 metre ceilings with exposed trusses add to the spacious atmosphere. The large modern kitchen is fitted with granite bench tops. The cupboards are stocked with crockery, glassware, cutlery and cookware to make your stay more comfortable. Through the kitchen is a family size laundry room and on to a two car garage. The master bedroom opens off the front entrance, separate from the other sleeping quarters. It has its own private, enclosed courtyard that captures northern sun and its own large bathroom. Across the living area, the second Queen bedroom has an en-suite. The two remaining bedrooms have twin singles and share a bathroom with separate toilet. To the back of the house is a second casual sitting/TV area with bi-fold doors that open onto an extensive outdoor entertaining area and swimming pool. This room provides excellent visual access to the fenced pool and grounds. Perfectly positioned to capture the winter sun, the heated pool is larger than most found in resorts and affords complete privacy. The large, lush garden features tropical fruit trees, gingers and palms as well as grassed areas. The secure and very private backyard captures the afternoon sun and is perfect for poolside relaxation or games with the kids.